We have many fundraisers and the reason they are so successful, is because we have amazing committee volunteers throughout the course of a year for you to participate in. It’s even more fun when you bring a friend! Fill out our Volunteer Information Form and email it or drop it off if you are interested in volunteering. Be sure to visit our events page to learn more about upcoming opportunities! The Movement Centre currently provides various fundraisers to assist our clients in raising funds to offset their fees. Send an email to justin@movementcentre.ca to find out what opportunities are currently available. Do you hold a weekly, monthly, or yearly event with proceeds designated to a charity? Pick us! Click here to download our Application for Special Event. Give us a call to find out more information or to book a tour of our facility! 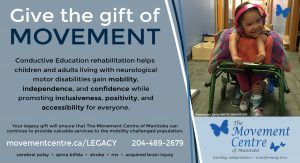 Click HERE to visit our Legacy page and learn how you can support The Movement Centre of Manitoba with Legacy Giving. “The Butterfly reminds us how powerful personal and physical transformations can be. Through Conductive Education Rehabilitation, The Movement Centre teaches children and adults living with physical disabilities independence for a better quality of life. The proceeds from the sale of each hand crafted butterfly will support The Movement Centre. 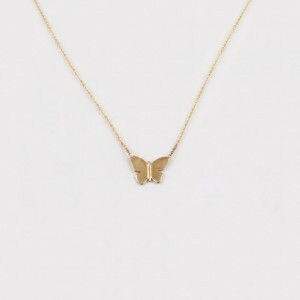 The Movement Centre “Butterfly” necklace was designed by Winnipeg’s Hilary Druxman. Silver necklaces are available at The Movement Centre. Both necklaces are available at Hilary Druxman Jeweler locations and online! 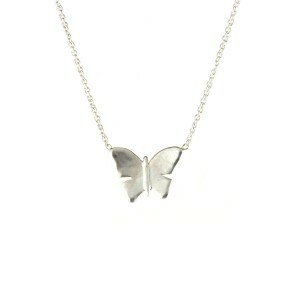 Proceeds from Butterfly necklaces sold by Hilary Druxman Jewelers also benefit The Movement Centre of Manitoba. Prizes! We have many fundraisers throughout the year where silent/rainbow auction packages are available and we are always in need of great items to include! Your time! Volunteer for our Annual Golf Tournament & Auction, make a team for the Move N’ Groove-a-Thon, or get involved in any of our many other events! We could always use a few things around our Centre, check out our list below! Children and Adult Games * Operation, Crocodile Dentist, Connect 4, Snakes & Ladders, etc. Craft Supplies * Construction Paper, Crayons, Markers, Googly Eyes, etc. Office Supplies/Equipment * Whiteboards, Printer Paper, Envelopes, Tape, etc. Please contact us if you have any other ideas or questions! It’s simple, tell your friends, coworkers, and community about us.